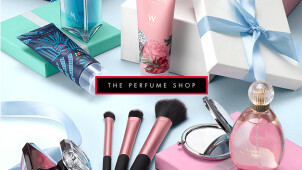 Exclusive Win 1 of 3 Fragrance Bundles from The Perfume Shop - Includes Paco Rabanne and Armani! Enter now to win 1 of 3 fragrance bundles including Paco Rabanne and Armani! 15% Off Orders Over £50 at The Perfume Shop Spend over £50 at The Perfume Shop and get 15% off! 10% Off Orders at The Perfume Shop Don't miss out on getting 10% off when shopping for your favourite fragrance at The Perfume Shop! 10% Student Discount at The Perfume Shop Hurry to take advantage of this great student discount at The Perfume Shop! Up to 50% Off Orders in the Sale at The Perfume Shop Let your jaw drop as low as the price of the discount fragrances in The Perfume Shop's sale! Free Gift with Orders at The Perfume Shop It's always nice to get a little something for free! Get a free gift when ordering selected fragrances at The Perfume Shop! Free Delivery on Orders at The Perfume Shop No need to worry about delivery fees when you're ordering at The Perfume Shop! Up to 50% Off Fragrances for Her at The Perfume Shop Get a great discount on fragrances for her from The Perfume Shop! Calvin Klein Fragrances from £15 at The Perfume Shop Shop the Calvin Klein range at The Perfume Shop, starting from £15! Free Returns on Orders at The Perfume Shop We understand that your order isn't always as you imagined, so you can send it back to The Perfume Shop for free! Up to 50% Off Fragrances for Him at The Perfume Shop If you're shopping for his favourite fragrance at The Perfume Shop, get up to 50% off! Bottle Engraving from £5.99 at The Perfume Shop Make your gift a little bit extra special with personalisation and bottle engraving from £5.99! Since its launch in 1992, The Perfume Shop still remains everyone’s go-to store for those luxury fragrance and celebrity perfume buys. Here is where you can find the most sought-after perfume brands, without the hefty price tag. For your everyday spritz, or for that special evening fragrance - you can shop plenty of options here alongside cosmetics too that will complement your signature scent. With the classic designer brands of the perfume world on offer, here you can find all of the Coco Chanel you need, while you can indulge in Paco Rabanne, Gucci and many more of your favourite names too. When you can browse by luxury fragrances, sporty picks, classic scents and more - you’ll be sure to stumble upon a fragrance to die for here. With gift sets, and even hampers too - you can get more from an already beautifully packaged perfume by presenting it in a box to wow the recipient. The Perfume Shop knows that getting a special fragrance can be the perfect choice to treat yourself or a loved one, so they aim to make your experience of the products on offer second-to-none. Don’t wait to see why this is the UK’s destination of choice for the perfect fragrance. How do I use my The Perfume Shop promo code? All other offers will be applied automatically if no code was required. Sign up to The Perfume Shop’s newsletter to get an array of special offers and glitzy updates about your favourite fragrance store. Where is my nearest The Perfume Shop? Use the store locator online to find The Perfume Shop closest to you! Does The Perfume Shop offer student discount? You can’t get an extra discount for being a student at the moment, but be sure to check out the offers page to find those sweet money-saving deals! Can I get my items engraved at The Perfume Shop? Yes, you can even personalise your perfume goods with engraving at The Perfume Shop! The Perfume Shop is happy to provide you with a refund or exchange for an unsuitable product within 28 days of purchase. Perfume is a luxurious gift that no one can resist, and at The Perfume Shop you’ll find the best designer bottles to spritz each and every day. It’s no secret the glistening bottles come with a hefty price tag, so shop smart with The Perfume Shop discount code, and save on fragrance for him and her. Whether you’re searching for your signature scent or selecting a loved one's gift – The Perfume Shop has the designer perfume waiting for you. For fragrance addicts committed to their signature scent – The Perfume Shop has an exclusive rewards club to allow you to receive rewards every time you shop. Collect points for every £1 you spend, and receive £5 off your next purchase when you’ve collected 100 points. You’ll also get a copy of their award-winning magazine, Scents and be entered into fantastic competitions to wins plenty of fabulous prices. Go the extra mile to celebrate a special occasion and browse the selection of perfume gifts gleaming with top designer brands. From sweet and pretty miniature collections to luxury perfume sets with matching scented body lotion and shower creams, there will be something for your recipient. Rest assured that the perfect perfume gift isn’t out of reach when you shop with The Perfume Shop promo code. Each gift set comes in a stunning presentation box, so you can be certain it will delight whoever you decide to gift it to, and will definitely be one to remember.